Picturing the unnoticed – For the fainthearted . . .
Instagram has prompted greater selectivity: whereas an entire album might have been added to Facebook, a single image is now chosen for Instagram. Since 2009, more than five thousand images were uploaded to my Facebook account; at one point more than a thousand pictures a year were being put into its albums. A digital camera and then an iPhone made possible an inclination to take pictures of the commonplace, an inclination that was strange and costly in the days of rolls of film that had to be developed and printed. Taking pictures of ordinary, everyday things was something to generally be avoided when the processing cost a lot of money, though looking back through pictures taken in the 1980s, there was still some pretty odd stuff among the holiday and the domestic snaps, signposts and gates being common. Ulster maritime historian Michael McCaughan was a good friend and a brilliant amateur photographer. He always said that if he couldn’t spend time taking photographs, the thing he wanted to do most in the world was to be a maritime historian. Michael could take the most dull and ordinary of scenes and find interest and texture and colour, causing one to pause and contemplate images that would not ordinarily register their presence, let alone prompt a second glance. The lack of cost entailed in taking and uploading a digital image means that it doesn’t matter if no-one else thinks the image was worth recording, it doesn’t matter if the image is without beauty or attractiveness to others, no-one is paying, and no-one else has even to look at them. There are moments when a picture will prompt a negative reaction, “why did you take a picture of a sign?” But perhaps the sign has a story to tell, perhaps it is a comment on the way things are. “Size isn’t everything . 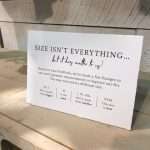 . . but it does matter to us,” announced a sign in a branch of a clothing store chain. Changes have been made to men’s garment measurements, the smaller sizes have been made bigger and the bigger sizes have been made smaller, allowing the introduction of XXXL as a size. A more logical step would be to label the garments with measurements in inches or centimetres, which are uniform wherever they are applied, but that would not allow for differences in size classification by different chains. It would be hard to imagine that such idiosyncrasies are not deliberate, that there is something calculated in the diversity. 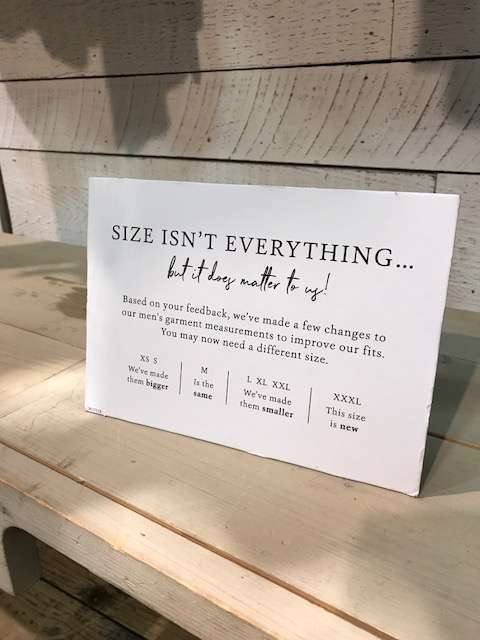 Presumably, familiarity with the particular peculiarities of size in a particular store helps create a sense that one knows what one is getting when one buys a garment, perhaps the sign is advice about size classification, perhaps it is about the building of brand loyalty. Perhaps the sign is a sign of corporate strategy in times when companies will attempt anything to gain an advantage. Maybe it’s worth a random picture. The smartphone killed stone dead the point and shoot segment of the camera manufacturers. Almost overnight. By 2010 the market for P&S was gone. Some manufacturers vanished, some simply were sold to Chinese companies and gutted. Some like Nikon and Canon survive by being a component of a gigantic corp. Nikon being part of Mitsubishi. The only issue about photo images over the last ten or so years is that while on the internet, they are largely lost to the home. For no one prints out images anymore. And when they do they find because the screen is back lit their money is lost. So, while we take lots more images we have almost none. I set up a studio for culture night in the Main Guard in Clonmel with that very idea in mind and had a almost 100 people in and 40 sat for a portrait. You have a good eye btw, you might use Aldi photo and get a book of your images printed.